This is our first exhibition that takes place at all PAVIA locations at the same time. Visual artist Jeffrey Cowling exhibits these beautifully elaborate works. At the same time History and Religious Studies Professor Lindsay Macumber has excerpts of her writing (essays, PhD dissertation along with class notes) displayed to create a possible new context for Jeffrey's work. Jeffrey Cowling became a member of the Society of Industrial Artists & Designers - 1971 (Illustration / Ceramics / Museum exhibition display) After 4 years studying design with Philip C. Smith, one of the worlds leading book binder/artists, Jeffrey began an apprenticeship with Philip, working on private commissions including a one of a kind binding of Alice in Wonderland, hand illustrated by Salvador Dali and a 6 volume book wall of the Lord of the Rings trilogy for the Tolkien family. Jeffrey was a ceramics Instructor at West Essex Technical College, London, England in 1971-1972, and an illustrator for Thames & Hudson Publishing and British Museum in London, England. Later he was a designer/Illustrator for British Rail - London England - 1972 -1973. After immigrating to Toronto, Canada in 1974, Jeffrey worked as senior designer with McManus & Associates Agency - 1974 -1985, designing seven Ontario provincial park visitor centres, museum exhibits for the Ontario Science Centre, retail interiors including Godiva Chocolates on Bloor Street, Toronto, Bonaventure Furniture showroom, Toronto and numerous corporate logos. Jeffrey was the recipient of a design award from the Art Directors Club of Toronto for his work on a Canada Post book and exhibition. After a 6 month break to travel the world and sketch, he started Jeffrey Cowling & Associates - Toronto Canada, 1986 – 1991 with clients including: Toyota, Mobil, Ministry of Natural Resources - Ontario, Ministry of Skills Development - Ontario, City Hall – Toronto and The Fashion Incubator (Festival of Fashion) Toronto. Jeffrey was an advisory board member for curriculum content for George Brown College, Toronto & Holland College (fashion department) PEI. After moving to Nova Scotia, Jeffrey started work as a Designer/Maker - Jeffrey Cowling & Associates - Halifax Canada – 1993 to present. During that time he was an instructor in product design at NSCAD University - Halifax Canada - 1999 – 2003. His clients include: Prime Ministers Office, Cirque du Soleil, Federal Office of Protocol, Innovacorp, Ocean Nutrition and Downtown Halifax Business Commission. Jeffrey curated “A Matter of Choice”, an exhibition of craft design at the Art Gallery of Nova Scotia in 1995 also exhibited at the Mary E. Black Gallery. In 2014 Jeffrey had a show of his funerary urns at the Mary E. Black Gallery, Halifax, with jeweler Catherine Beck entitled Presence of Absence. He curated the 40th. Anniversary exhibition for the Nova Scotia Designer Crafts Council of Master Artisans work, exhibited at the Mary E. Black Gallery in 2016. As a designer/maker of furniture & accessories, he has developed a range of contemporary high design furnishings for both production & one-of-a-kind commissions. Jeffrey has participated in retail & wholesale shows nationally & internationally, including The Buyers Market of American Craft/ Philadelphia, Interior Design Show/Toronto, One of a Kind Show/Toronto. 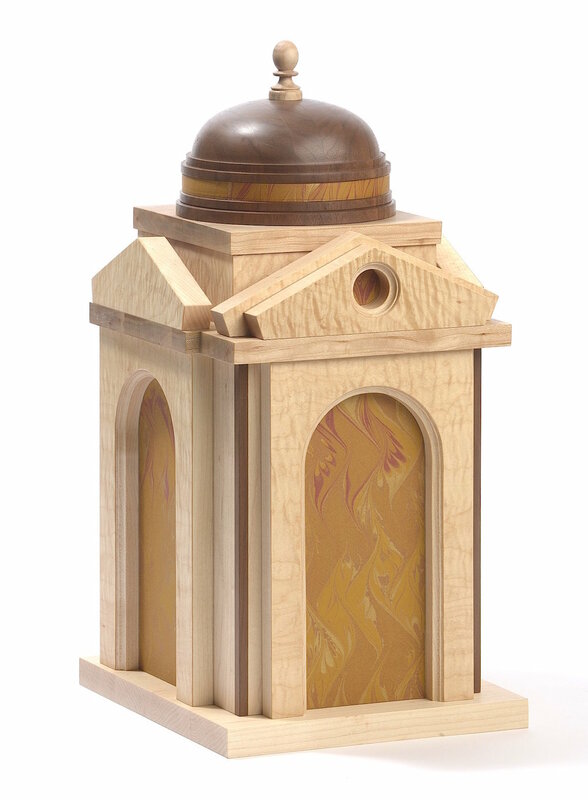 Recently he has focused on creating custom reliquary boxes, funerary urns and hand made books. He has received awards of excellence from the One-of-a-Kind Show, Toronto and recipient of the Award of Excellence in Product Design’ Atlantic Canada Crafts Awards 2003-2004. He was also a Portia White committee member in 2005. He is a member and previous chair of the Standards Committee of the Nova Scotia Designer Craft Council as well as Vice-President. He is an NSDCC representative to the Cultural Federations of Nova Scotia. 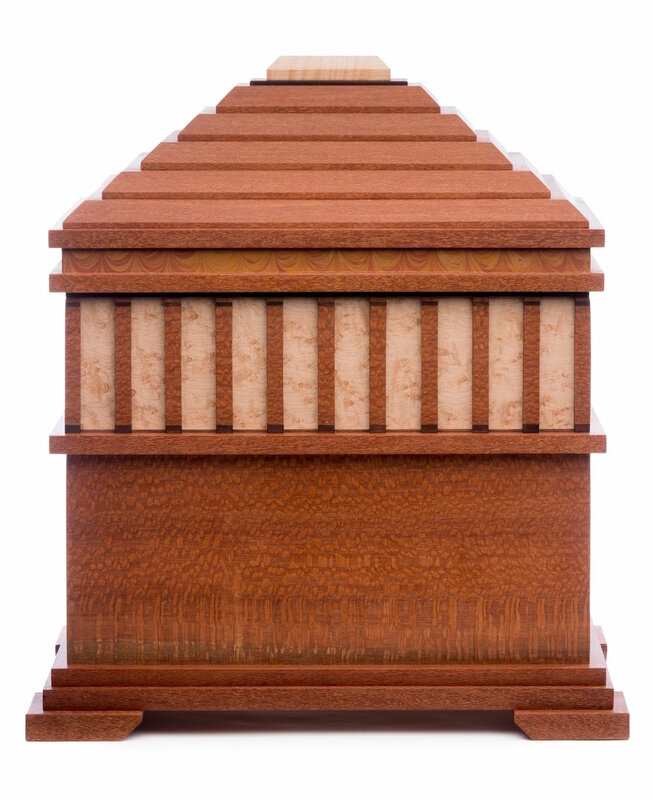 Incorporating symbolic architectural styles from around the world, my custom designed reliquary boxes and funeral urns are the result of travels to the Far East, including Thailand, India and China, the Middle East including Oman, Jordan, Israel and Turkey, Europe, Central and South America, and Australia. During these visits my constant companions were sketchbooks and pencils, (assisted by the occasional bottle of wine) and a need to capture the essence of the place, through the multi-sensory experience of drawing. By investing considerable time in these sketches and making notes of various encounters, I have created an easily accessible 3 dimensional vivid record & resource. My sketches and drawings are more than records of a building I visited. They capture the very spirit of the place with interactions both memorable and profound. Using these records as inspiration for my architectural box designs, some pieces are a record of a life ended. Others are of a friendship that has “moved on” and been lost in time. Created from exotic woods, handmade marbled papers, semi-precious stones, gold leaf and sumptuous textiles, each container recognizes and celebrates the unique journey we take through life. For me, the intention of this current body of work is purely selfish…to figure out how to overcome selfish loss and move on. To be able to visit the memory of someone I loved and to truly enjoy the experience, as if they were still here, still able to share in what’s happening now. To be there with me again. Lindsay Macumber has been teaching religious studies and history at number of Maritime universities (including Saint Mary’s, Dalhousie, and Mount Allison), for six years. Her areas of specialization include Holocaust representation and religion and popular culture. In the 2017-18 academic year she will be teaching Twentieth Century Germany, and Twentieth Century Europe in Literature, Art and Film, at Dalhousie; as well as Religion and Violence, Religion and Contemporary Culture, Death, and Judaism at Saint Mary’s. She did her graduate work at the University of Toronto, where her doctoral dissertation, “Understanding, Reconciliation, and Prevention: Rethinking Hannah Arendt’s Representation of the Holocaust,” considered the ethical and practical implications of Hannah Arendt’s representation of the Holocaust. Having completed her undergraduate work in religious studies at Saint Mary’s, she is happy to be back in the city and community that initially inspired her work and thinking. Please understand that as you read this that in 120 years you, and everybody who is in your proximity right now, will no longer exist. What will be your legacy? When our possessions are in a landfill and our plastic and chipboard houses are replaced with something else, what of you will remain? Will you create a work of art that will endure the century? Will a poem you wrote on the back of scrap paper in high school speak to a future generation? Will a Facebook post that that gets rediscovered in 2137 expose your brilliance to the world? Will an email that you accidentally replied-all to, proving that you were right and they were all wrong, inspire a revolution? Or will you be a nameless, faceless human whose only importance was that you were a part of this generation during a moment in time when something significant happened that you had nothing to do with? What happens when a person dies? Is there an afterlife? Are we re-incarnated? Is there a paradise, inferno or purgatory? Is it simply the end of a life which is followed by absolute nothingness? What we do know is that for those of us who have lost a loved one the answer is simple: A void has been created in our life. The person only continues to exist on in our memory, by the stories we share with other people, by monuments we create. Please understand that as you read this that in 120 years you, and everybody who is in your proximity right now, will no longer exist. Does this information cause you to dream or despair? Does this idea inspire you to action or render you still? Does this simple thought change your life in even the smallest way that causes the rest of your years to move forward in a direction that you never could have imagined? How do we preserve the history of a person? How do we tell the whole story of a life to one who does not know that person? How do we explain to someone 120 years from now how important that person was to you when you are not there to explain to them how important they were? Jeffrey Cowling does more that just build memory boxes where people can preserve the ashes of a body, he creates exquisitely-built monuments to house important artefacts and superficial souvenirs of lives once lived. As an artist, he also creates art pieces that are, in fact, monuments to his life. Will these monuments, therefore, preserve two lives? Lindsay Macumber preserves her opinions through the written word, publishing her ideas and teaching. Within her academic practice she deconstructs monuments (both explicit and implicit) that have been constructed throughout history. Like monuments to departed individuals, these representations are invariably coloured by personal, cultural and political perspectives. She hopes her legacy will allow those who engage with her work to deconstruct her perspectives. As long as her writing exists and is accessible, will she, and her thoughts, live on? Please understand that as you read this that in 120 years you, and everybody who is in your proximity right now, will no longer exist. How will people know who you are? How will people know that you once stood right here? What version of your version of your truth will people remember? What will be your monument?